All of these symptoms could indicate a more serious injury or concussion. If any of these symptoms are present you should return to the Doctor or hospital. If the injury is severe, visit your Doctor or local hospital to get the neck region fully assessed for injuries such as fractures or nerve damage. Symptoms of a possible nerve injury may include pins and needles, tingling (paraesthesia in the neck, shoulders or arms or even numbness (anesthesia) in the same area) and these should not be ignored. In the early stages of the injury, apply the principles of P.R.I.C.E to reduce inflammation in the area and to reduce pain. This includes possibly using a collar for a short period of a day or two, relative rest (some minimal movement, not NO movement) and cold therapy. Advice to use neck collars for more than a day or two (maximum) as a treatment for whiplash injuries has significantly reduced over recent years because early but controlled movement exercises of the neck are strongly encouraged to improve the overall outcome and decrease recovery time. Applying cold therapy can help relieve pain and inflammation in the first 24-48 hours. Do not apply ice directly to the skin as it can cause ice burns but use a wet towel or better still a commercially available ice pack. Cold can be applied for 10 minutes every hour initially. This will help stop any bleeding in the muscles, reduce pain, reduce inflammation and have a muscle relaxing effect when the ice is removed. Your Doctor may choose to prescribe painkillers or anti-inflammatories, such as ibuprofen or diclofenac sodium (voltarol). These will reduce pain in the area and hopefully encourage the muscles to relax which will allow for more movement and therefore better recovery. Neck collars can sometimes be used for the first 24 to 48 hours to reduce pain in the area and allow the muscles to relax, however, their use must be limited to the early stages. 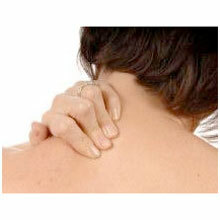 The main aim of treatment for whiplash is to slowly get the neck moving without making the pain worse. Keeping the neck still after the first 24 hours is not advised as it will stiffen and cause more pain in the long term. Gentle exercises to move the neck are strongly encouraged as soon as the pain starts to settle as these encourage normal movement and restore normal function of the neck muscles and ligaments. Try to gently move your neck in all directions as soon as you are able to, and repeat this every 2 – 3 hours. Each time, aim to move the neck further to increase its’ overall range of movement but make sure that the exercises are always performed within pain-free limits. Pulling your chin horizontally backward to tuck your chin in. This movement is called retraction. Gently pull your shoulder blades back towards each other and gently downwards to strengthen the muscles in the upper back to improve posture and take some of the strain off the neck region. Finally, make sure you use pillows at night to fully support the neck and to allow the muscles to relax overnight. Sleep can sometimes be affected by whiplash which is why it is very important to ensure that you use the correct number of pillows and ensure they are comfortable but not too soft. A guide to correct pillow height and position is to lie on your side and ask someone to see whether your neck is horizontal. Once the acute inflammatory phase (minimum 72 hours) has passed, massage may help to reduce possible muscle spasm in the area and restore normal function to the neck.